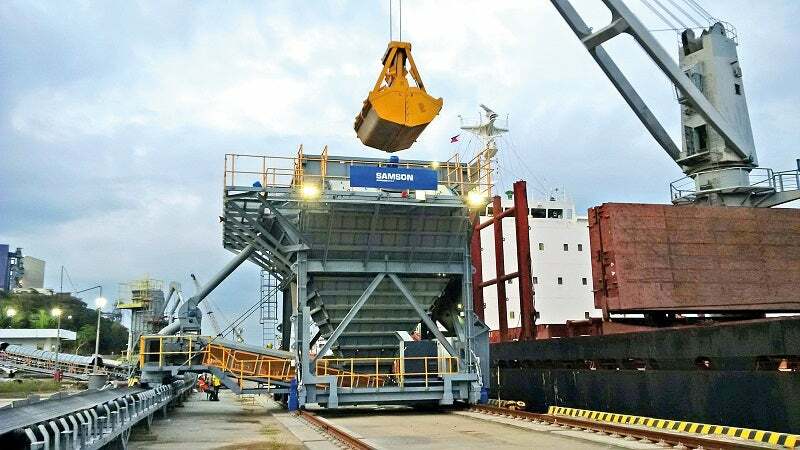 SAMSON Materials Handling has received an order from TradeMark East Africa for four Eco-Hoppers with ATEX to be employed at the Port of Mombasa in Kenya. This was won following a lengthy and complicated tender process. The engineering design is the result of the successful collaboration of the AUMUND Group of companies involving SAMSON Materials Handling, Ely, UK, and engineers from SCHADE Lagertechnik in Germany. Four identical Eco Hoppers will be used for the environmentally respectful import of Clinker, Coal and Gypsum. Management of air quality and fugitive dust is very important as operation will be in a dusty atmosphere with high levels of humidity and temperatures ranging from 22°C to 40°C. A variety of dust suppression measures will be employed both at the intake area of the Eco Hopper itself, as well as on a dusting system situated between the hopper and truck. The dust reduction measures include an automatic reverse-jet cleaning system, air compressors, inlet grill with suction capacity, a flex-flap creating a pressure differential and a dust filter unit on three sides of the hopper. The Eco Hopper 6m² inlet grill is topped by a 2m-high shroud, which creates an 8.2m² aperture for grab discharge thus mitigating the effects of high winds. The Eco Hopper is mounted on a chassis which brings the total height of the configuration to 15.7m, allowing a truck clearance height exceeding 4m. The four Eco Hoppers for the Port of Mombasa are mobile powered travel with crabbing functionality to enable specific positioning of the hoppers alongside the vessel. The throughput of each Eco Hopper is designed to operate at a peak rate of 700t/h. A unique development to the four Eco Hoppers that will be supplied to the Kenya Port Authority is the introduction of ATEX, which for dust filtration import hoppers is a first of its kind into the market.